July was the month of visits for me. I have lived in good ole Nashville (Franklin) for a year and a half and it seemed like July was the month everyone decided to come see me haha. I’m not complaining! It was one of the busiest/most fun months this year. I had come home for a show in NC and my band decided they wanted to come back with me to Franklin to play at Mellow Mushroom. So the 4 of us traveled that Wednesday and played at Mellow that night. My guitarist and bass player left the next morning but Paul and Melinda stayed on for a few more days to visit with me. I showed them the sights! 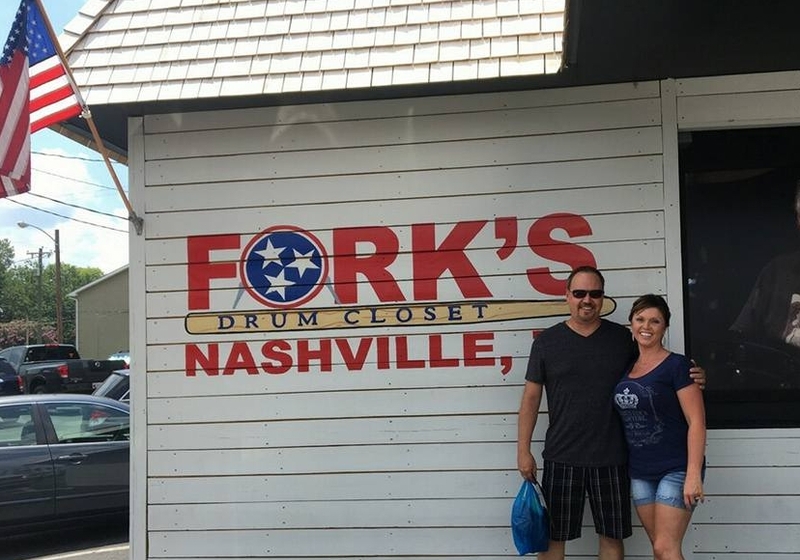 I took Paul to Fork’s Drum Closet. Side note: I think he just about died because it was like heaven to him haha. It was really great because I got to show them all the places I love to go and eat at. I really felt like a tour guide. We went and toured the Ryman and I showed them around Franklin and Leiper’s Fork. There’s nothing like having friends that genuinely care about what your new life is like and the town you moved to. When they left I almost cried. I loved every minute of having friends that feel like family here with me. Me and Paul at the I believe in Nashville mural! The very next week I had a friend from Charlotte come and stay a few days with me at my apartment. Gabrielle Sophia! If you haven’t seen me post about her before on my social media definitely go and check her out! She has a brand spankin’ new website! I picked her up from her tour of Belmont and we went straight to the Kimbro’s Open Mic. Everyone there seemed to really enjoy her music. Throughout the week we went thrift store shopping and I took her to all the cool record stores I could think of. We ended our week by hitting up Puckett’s Open Mic too. It was a lot of fun. After I dropped her off at the airport I think I slept for a week haha. It felt awfully lonely and boring after all the visits and traveling I did in July. Overall I had so much fun. Getting to show people the place I now call home and introduce them to my new friends is one of the best things ever. July, you were a good month. I look forward to my upcoming #VintageTour! Check out my website for all the dates! Thank you to everyone who visited me. I love you guys soooooooo much!